A Wine Scamp Bloggerpack? Surely you jest! So months ago, Jill from Domaine 547, the hippest online wine shop run by a blogger, approached me about taking part of her blogger-pack program. I was quite excited to do so, as so many of my favorite wine bloggers have been involved already and it’s time I started hanging with a good crowd. But what two- or three-pack of wine says Scamp? Jeff Lefevere of Good Grape did a neat selection of Alsatian varietals from the Willamette Valley. Awesome idea, and as an Oregonian I couldn’t agree more about promoting the whites from that region. Dr. Debs of Good Wine Under $20 did a great round-the-world trip of value, very apropos for her blog. I love good cheap wine, so was full of admiration for this idea. Brooklynguy did a two-pack of Loire wines, which he recommended for the holidays, and Ryan and Gabrielle of Catavino did a grouping of great Portuguese wines. All great concepts, and I couldn’t bear to copy anyone. So I went back in my head (envision Wayne’s World wavy lines) to the days when I taught a weekly wine class, and remembered that my favorite classes to teach were the “X Varietal Around the World” ones. And because I’m such a Syrah freak, I thought we’d go that direction. Jill agreed, and we started trying to think about what three wines could take us around the world on the Syrah magic carpet ride… for about $60 bucks. This was seriously hard work! See, if you’re going to do a Syrah Around the World (which could sound positively dirty if you say it right), you must have a French one. But in France, they do not make very many 100% Syrah wines — mostly, they blend Syrah with Grenache and other lovely varietals into wines called Cotes du Rhone, Chateauneuf de Pape, etc. But you HAVE to have a French Syrah, because Syrah’s done so differently there and that’s the whole point of a ‘Round the World tasting: regional styles. The two French wines that are all or mostly Syrah are: Hermitage Rouge and Crozes-Hermitage Rouge. The former is v. expensive. The latter is rather expensive. Jill and I spent most of our debate time looking, but finally found a C-H for Not Much Money that tastes French, from the good folks at Dme Ferraton. Voila. Finally, a Californian Syrah. I hadn’t heard of the winery that Jill suggested, but once I tried them I was very impressed. Not telling, though, until I post the actual review. A huge shout-out must go to my friend Lady J, who spent last Sunday on the couch watching movies and tasting (well, she was drinking) wine with me. Her presence got me to ignore the morning sickness nausea that has become my hourly companion and pop the corks that have been nagging me for weeks and weeks. Plus I knew that the bottles I opened went to a good home. 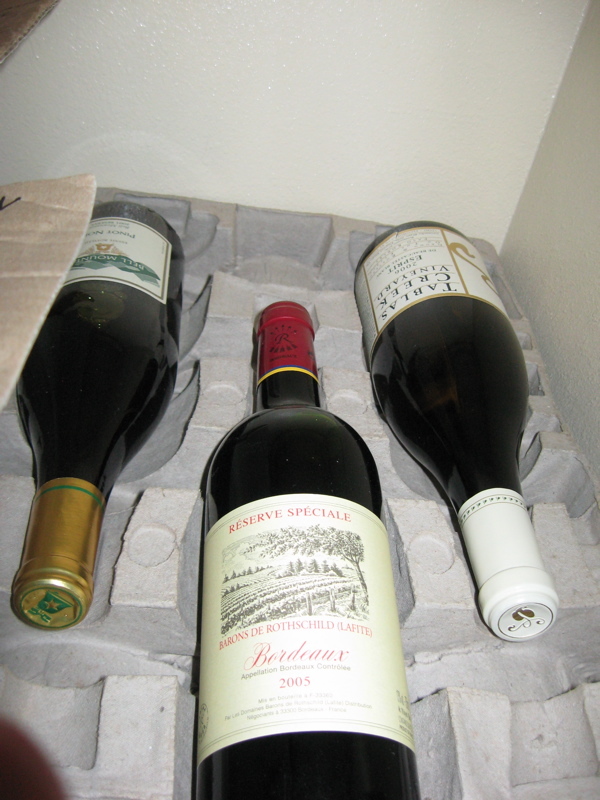 So be on the look-out for reviews of the three wines in the blogger-pack upcoming. I’ve been so remiss that I might be at the back of the blogger-pack line, but reviews you shall have, dearies, and sooner than summer this time. As a post-script I must note that I REALLY MISS DRINKING WINE. Tasting it makes me miss it that much more. And these three bottles were SO good. Gah. According to the Guardian, the British Medical Journal suggests that alcoholic overindulgence could be curtailed by selling bottles of wine that are 500 ml instead of 750 ml. The notion is that if two people open a bottle over dinner and have a glass each, they then proceed to finish the entire bottle so as to not waste any wine, getting dangerously sloshed in the process. It’s likened to the way “super-sized” portions on a plate induce a diner to eat too much food. Thus, British supermarket chain Waitrose is debuting a line called Vin à Deux, consisting of eight premium French wines in 50 cl (that’s 500 ml in Britain) bottles. They’ll also expand their selection of wines in 250 ml bottles, while phasing out 375 ml — your typical half bottle — altogether. Is Waitrose saving the British public from their own sot-like impulses? Gracious, but it seems to me that we have more than enough options for wine containers, especially that of the wine “box,” in which the plastic bladder-like container never allows air in and thus never lets wine go bad in the first place. 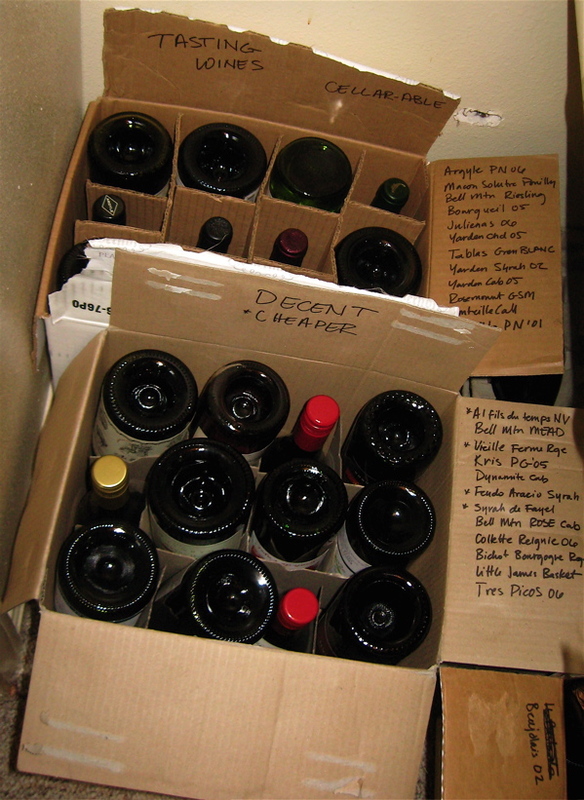 If having a 5-liter box of wine in the fridge doesn’t lead to “overserving,” at home, then why on earth would having three-quarters of a liter in a bottle? This is the perfect opportunity for a new poll, don’t you think? Please direct your attention below and share your opinion via a few clicks or, certainly, a comment! I’m saddened to hear that Jamie Davies passed away on Tuesday at the age of 73. She and her husband Jack Davies pioneered sparkling wine in California when they founded the iconic Schramsberg Vineyards in 1965 in the Napa Valley. In addition to producing some of the best sparkling wine in the world for over 40 years, the couple had three sons. Hugh Davies began to work for the winery in 1996, and Jamie and the family continued to run the winery after Jack passed away in 1998. I had the pleasure to work with Hugh when I represented his wines in the US Virgin Islands; he visited the market multiple times, and I was always impressed with his gentle, cheerful manner and infectious enthusiasm for sparkling wine. My heart goes out to the entire Davies family at this difficult time. For a full obituary of Jamie Davies’ life, try the Napa Valley Register or the San Francisco Chronicle. 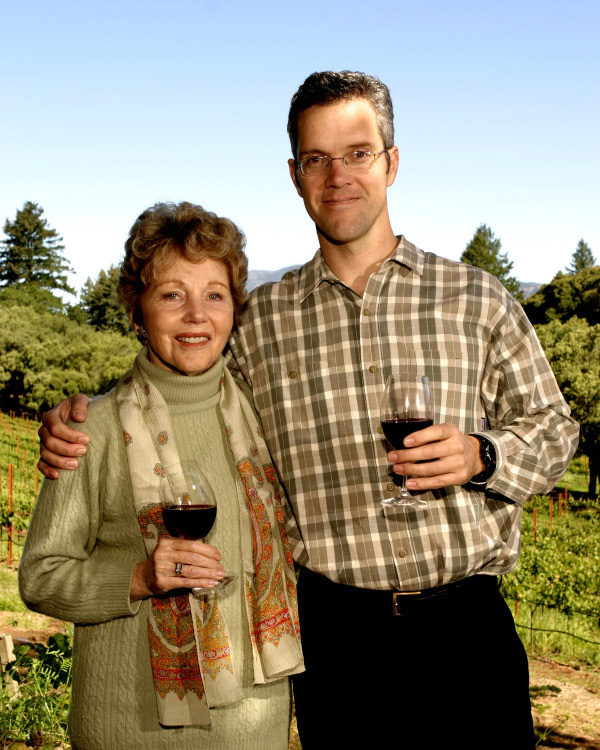 Jamie Davies , Grande Dame of Calistoga, will be sorely missed. All of us here at Wine Scamp International raise a glass in her honor.